Increasing competition between pharmaceutical companies to get drugs to market faster causes increased challenges. 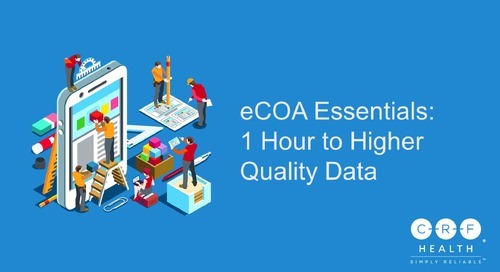 Companies are trying to collect more data within a clinical trial, and are therefore using more eCOA instruments than in the past Global studies require additional translations. The additional work and increase competition means shortened timelines. These additional components need to be provided to an ever increasing number of Ethics Committees, resulting in shortened timelines. 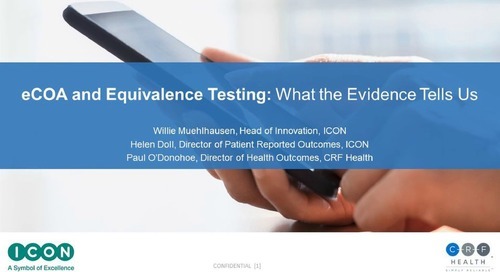 This presentation discusses the translation process, needs, requirements, review cycles, and regulations surrounding the use of eCOA in clinical studies and the need for linguistic validation. Good day to everyone joining us, and welcome to today’s Xtalks webinar. Today’s talk is entitled Translation of eCOA in Global Studies – Challenges and Solutions. My name is Michelle Tran and I’ll be your Xtalks host for today. 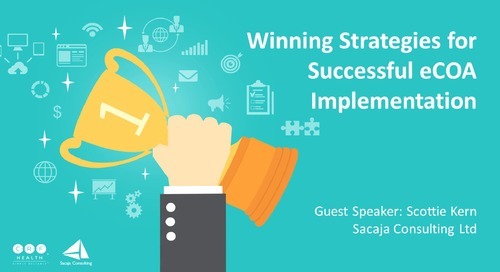 Today’s webinar will run for approximately 60 minutes and includes a Q&A session with our speakers. 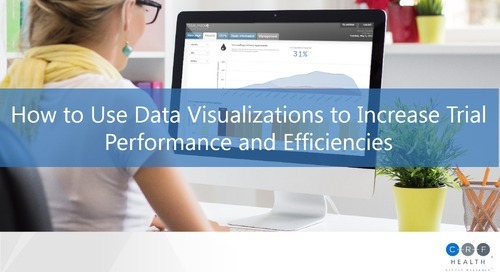 This webinar is designed to be interactive, and webinars do work best when you’re involved. So please feel free to submit questions and comments for our speakers throughout the presentation. Use the question chat box, and we’ll try to attend to your questions during that Q&A session. The chat box is located in the control panel on the righthand side of your screen. If you require any assistance, please contact me at any time by sending a message using this chat panel. At this time all participants are in listen-only mode, and please note that this event will be recorded and made available for future download. 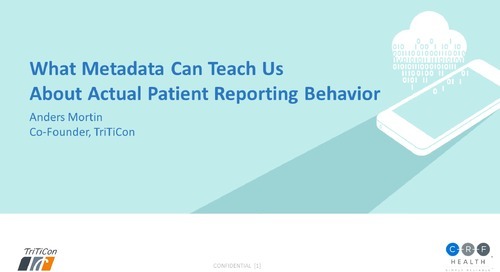 At this point, I’d like to thank CRF Health for developing content of this presentation. 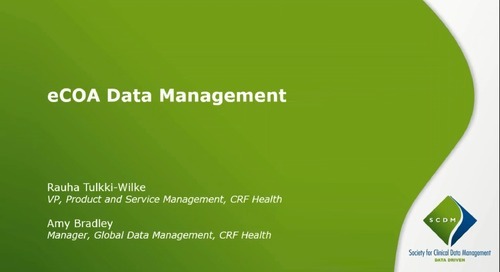 CRF Health is the leading provider of electronic clinical outcome assessment solutions for global clinical trials with experience in over 500 trials across more than 70 countries, and in over 100 languages, CRF Health's TrialMax eCOA solutions consistently demonstrate the industry’s highest data accuracy, patient and site compliance, and patient retention. 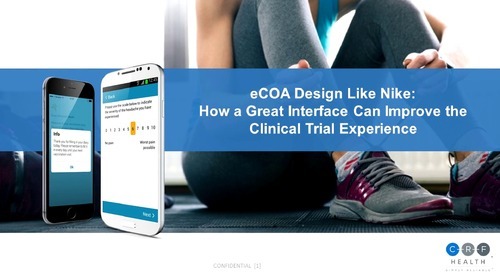 The TrialMax eCOA solutions improve patient engagement by fitting within the lives of patients and seamlessly integrating into clinical studies to maximize protocol compliance. 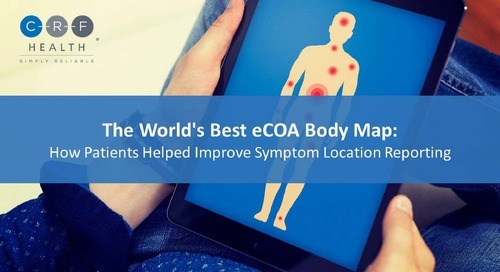 Their eCOA solutions include patient-reported outcomes, observer reported outcomes, and clinician or rater reported outcomes. I’d also like to thank TransPerfect Life Sciences, the world’s premier provider of global communications solutions to the pharmaceutical, biotechnology, and healthcare industries. As a women-owned business supported by more than 85 offices on six continents, including more than 20 production hubs, helps life science companies conduct clinical developments and commercialize products on a global scale. Within this team is TransPerfect’s Linguistic Validation Practice Group, which is comprised of experts versed in maximizing the conceptual equivalence and cultural appropriateness of your multi-country COA measures in a wide range of therapeutic areas and via a variety of administrative modes. Together with the entire Life Sciences team, TransPerfect’s Linguistic Validation Practice Group combines industry expertise with technology tools to provide end-to-end clinical trial solutions. And now I’d like to introduce our featured speakers for today’s event, the first being Colleen Chulis, Global Director of Linguistic Validation, TransPerfect. Colleen started her career at TransPerfect in 2005 and has grown her direct team to manage over $30 million annually. Colleen is an expert in the linguistic validation process of COAs, especially eCOAs, with her team managing over 300 projects per year of linguistic validation for clients such as Merck, Pfizer, Novo Nordisk, Quintiles, and many others. Our second speaker today is Brielle Sydor, Account Executive of Linguistic Validation, TransPerfect. Brielle is responsible for overseeing the linguistic validation and electronic migration of clinical outcome assessments. Her responsibilities include managing translations that comply with FDA and ISPOR guidance, conducting paper to eCOA migration assessments for multilingual studies, and creating efficiencies in the eCOA process. Brielle’s expertise in streamlining the linguistic validation and eCOA workflow has enabled her top pharma clients to file early submissions in over 100 countries. And our final speaker for today is Jane Carter, Program Director at CRF Health. Jane oversees two key accounts totaling 46 products and worked in the pharmaceutical industry for over 18 years, having started her career in IVRS at PAREXEL/Perceptive Informatics. Jane has been at CRF Health since 2005 and has extensive experience working with multiple translation providers, both for IVRS and eCOA solutions. And now without any further ado, I’d like to pass the mic over to Jane. Jane, you may begin when ready. Thank you. Welcome everyone. Thank you for attending our webinar today for Localization of eCOA in Global Studies and Challenges and Solutions. As we mentioned before eCOA encompasses patient reported outcomes, clinician-reported outcomes and either observer or rater collected outcomes. So this is a broad-based solution and we want to cover all the different translation processes it encompasses. So the goal for us today is to identify localization considerations for implementing eCOA solutions in a clinical trial with respect to process, timelines, and circumstances for linguistic validation, as well as to increase awareness of best practices when migrating paper translations to an electronic format, also when translating for an electronic device. So first we’re going to cover the standard localization process. Then some localization considerations, localization timeline, and then the importance of linguistic validation, best practices, and then we’ll have a Q&A at the end. So the standard localization process, what we’re speaking to here is translating other items not going through linguistic validation. So for example, if we already have the validated translations of copyrighted questionnaires, we have that piece—we’ll cover how to handle getting a new translation for that in a minute. But this piece is other types of screens, many of the ancillary screens, any types of in-house assessments or dosing or anything like that, as well as quick reference guides and other ancillary documents that we’re providing. So when preparing for localization, the first thing you want to do is obtain the English version of any of these assessments or instruments and any existing localized versions. This may mean requiring licensing the instruments from the developer or copyright holder. And that is usually handled by the sponsor. Sometimes CRF Health and/or a translation provider like TransPerfect might be authorized or scoped to get that. So you would obtain the license from the instrument copyright holder or the developer. And then, you contact the localization vendor in order to translate any new material. So here are the steps that would occur. I want to make sure that everybody is aware of the different steps in the process. So the eCOA vendor would submit the English screen report, which is a printout of all of the screens on the device with all the instruments and any ancillary screens like the save screen or sending data or anything that is not a validated instrument. Then the localization provider will localize or LSP would provide the localization—they would localize all of the documents using a text file for the screen report. So any text that is on the screens in the device would be exported to a spreadsheet or a text file. And the LSP would then localize all of those phrases from English to the local language, and then would provide those back to us, which we would then import and create the localized screen report. Now keep in mind, certain languages have to take up larger space on the screen than others. So for example, if you were starting with English and then translating into Hungarian, you need to allow for the appropriate spacing so that the Hungarian text would fit on the screen as well. We would generate those screen reports, send them back to the LSP to provide those. They would review them, make sure everything works in context and everything is fitting appropriately. They would provide all those documents to the sponsor. The sponsor would then have a local affiliate review and provide any comments, send them back to the LSP to review those localized—they would review the localized screen reports with the comments, and then provide that information to us, they would review and make sure they are accurate changes and that they are language appropriate and age appropriate, and provide those to us to implement the changes, or the eCOA vendors. Then the localization vendor would provide that—all of that, including any final ancillary documents. So for example, if we’re providing a quick reference guide to a subject with instructions on how to use the device, we would include the translated screen pictures as well as instructions next to them. All of that would be reviewed by the LSP, and we would finalize those documents, send those for certification, and then the certification would be provided to the sponsor. 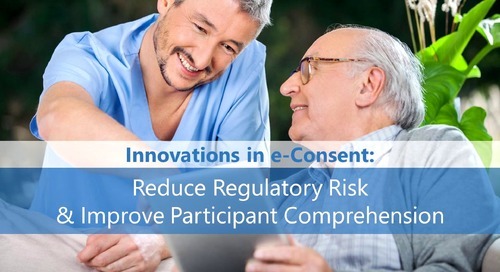 The eCOA vendor would provide all of that—the final localized file, and the certification--and then finally they would be submitted to the IRB or ethics committee. Okay? There are multiple steps and multiple back and forth, but the whole goal is to prove a final quality product for delivery to the IRB. So from a resourcing perspective, what do you need to consider when you are asking for a translation. You would need contracts teams for each party. You’d need localization coordinators with a key contact for each party. You would need to have local affiliates at either the sponsor or the CRO lined up to perform the reviews. And then you would need an IRB coordinator at the sponsor. All of these timelines, we’ll talk about timelines in detail further down the presentation, but that IRB coordinator is critical to identify when all those submission dates are so we can order the priority of those translations to be done ahead of time in order to meet that submission. I believe Brielle will take the next two slides. Thanks Jane. Yeah, I’ll be touching on localization considerations right now, so basically, what should you be thinking about before you even begin translation. So the first thing to consider is what is included in typical eCOA IRB package, what are you actually sending to the submission board. The first thing is the screen report, which is the report showing all subject facing screens and pop-up messages that will appear on the device. So this includes anything that the patient will see when using the device. And that just ensures that we’re reviewing and certifying all translated text that would be communicated to the patient, whether this be part of the COA or, like I said, pop-up screens. So next is the quick-reference guide, also known as a QRG, and this is a short booklet highlighting key points for the subjects on how to use the devices, along with contact information for additional support. So if there’s some question that the QRG can’t answer, how do they find the answer to their question. So this is essentially the how-to guide that contains localized screenshots that are sort of similar to the screen report, but then also has instructions on how to use the device. And then in addition to that, the contact information for additional support, so some sort of multi-lingual help desk, which Jane will go into a little bit more detail about later. But basically, how do they find the answer to any questions that the QRG doesn’t answer. The third item is the device sticker or device label. And this is a sticker that adheres to the back of the device and provides key protocol and contact information, again, to receive help desk support if needed. The final item in the IRB submission package are the localization certificates. And these are typically provided by the LSP, language service provider, and they certify that the translation is a true and accurate representation of the English source file. So the certificate will typically list the name of the file that’s certified, the language pair—so if it’s going from English to French, English to German, what language that final translation is in—the translation process that was used, and then the signature of a notary verifying that the information is valid. Additional localization considerations to look into are, do the assessments need to be localized, and if so, they need to go not just to the language but to the country as well. Given the differences in dialects across different countries, it’s definitely recommended to localize the language to the specific country where it’s being used, no matter how geographically close the countries might be. So one example is that the Dominican Republic and Mexico, Argentina, and Venezuela all use a different word for the term “bruising.” So you would not want to use just one single Spanish COA in all these different countries because the terminology may confuse the patient and result in unreliable data. In relation to this you also want to consider that some countries have several languages that are common, not just one language that they use. An example is Switzerland. If you have sites there, you'd want to make sure that you have devices available in French, Italian, and German to accommodate all of the dominant languages spoken in that country. 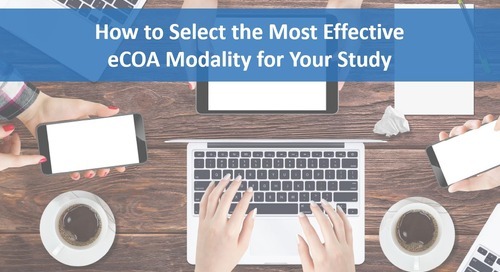 Secondly, you also want to determine all countries and languages required for each COA, as this can vary within a single study. Ideally you should be using the same COAs in every country to maintain consistency of data, and so you’ll want to plan ahead to see if there are existing translations available, or if new translations will need to be completed. And a third consideration is post-localization testing. And we already discussed early, we do a screen shot review on the screen reports. Post-localization testing is when we review the translation on the device itself. And this is an additional quality step that comes after all of the translations have been completed and certified, and it includes two different methods. One is the technical testing, so this is looking at device functionality, bug review and fixing, regression, basically making sure everything appears correctly on the device, there’s no undefined text, there’s no buttons that don’t lead you to the screen that you’re trying to get to. And then the second aspect is the linguistic testing. And this is where we would have a linguist actually go through the screens on the device, work through the device, to ensure that the language selection feature works properly, that none of the text was truncated, and that anything that has auto population populated correctly, so anything that needs to be plural is plural, singular is singular, many languages have masculine and feminine aspect to them, so making sure that all the text is showing up correctly that way as well. So the next thing I’m sure everyone’s concerned about that we’ll be discussing are, what are the timelines for this, how long does it take. I’m going to turn it over to Michelle right now for a quick polling question. Thank you very much for that Brielle. At this point we do have a polling question, which the audience can go on in real time just by clicking on their screen. So the question we are asking the audience is, how many weeks before first patient’s first visit do you usually plan your localization efforts. Your options are 1-4 weeks, 5-8 weeks, 9-12 weeks, 13-16 weeks, or more than 16 weeks. And again, the question is, how many weeks before FPFV do you usually plan your localization efforts. And I’ll give the audience a few more seconds to vote. Again, you can click your vote in just by clicking on your screen. And it looks as if most of the audience has voted, I’ll let you get a few more votes in. So I’ll close the poll now and just share the results. Here we can see the majority being more than 16 weeks, at 38%, 9-12 weeks is next at 25%, 5-8 weeks and 13-16 weeks are tied at 16%, and 1-4 weeks is in last place at 6%. And with that I’ll just hand it back to you. So one thing we want to be aware of is the factors that affect these localization timelines, what you need to consider when you think about how far out you need to plan and how localization will be coordinated. So the first one is the number of languages that will be involved in your study. Obviously the more languages there are, the more time that the process is going to take. Similar to this, how many instruments will you be using. Is it one COA, five, then? This again will help determine how long the entire localization process will take to be completed. An aspect that is not as easy to predict ahead of time if there requirements of the instrument license holders. 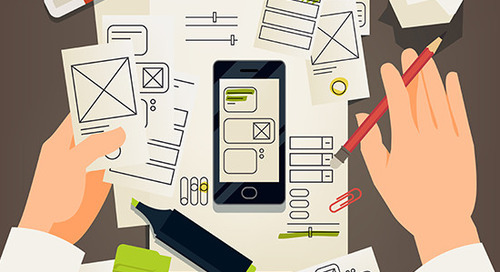 Many developers like to be involved in the translation process and require that they review the file at different stages of the translation process. This involvement can be extremely helpful given the developer’s familiarity with the COA, but it can also add to the timeline depending on the number of reviews, the length of those reviews, and the volume of feedback that they have on the translation at each step. Finally, IRB submission dates are another thing to consider when planning out your timelines. Our best practice is to structure localization timelines based on the priority submission dates, and this allows the team to address the most pressing languages first, so what countries you’re filing first, and that helps to create a more staggered workload for the eCOA vendor and LSP to ensure that all IRB submission dates are hit. And then we’ll go on to the next slide, and the million dollar question that I’m sure you all have: How long does this process actually take and how do you plan ahead efficiently. As you’ll see, this is a similar slide to the one Jane presented earlier on the process. And what we’ve done is add the standard turnaround time for each step, each part of that process, so you can see kind of overall where the bulk of these timelines lie. So the first step when the eCOA vendor is submitting English screens to the localization vendor can typically take 2-3 weeks after the kick-off meeting. After that, the LSP to localize these documents, that just depends on the number of languages and the approach—are we doing a more basic localization approach or a linguistic validation, which Colleen will speak about later, which can be a lot more involved. After that, the eCOA vendor creates the screen reports. We see this typically taking an average of 3-5 days to go from the translator text the LSP provides to actually generating the screens that the patients will be seeing. Followed by that, the LSP sends these screen reports to the sponsor to do a review. And this is an optional step, but we’ve found that many sponsors would like to send the screen reports to their in-country affiliates to review them and make sure that they're in accordance with any company preferences or any specific requirements for that country. 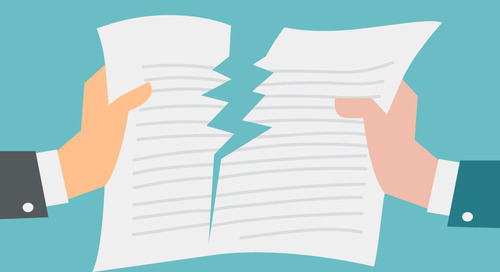 So after typically 1-3 days for that process, they’ll send them back to the LSPs for review to consolidate any edits, any feedback that was given, which will then be sent to the eCOA vendor to implement those changes. And that review process, like I said, takes about 5-7 days. Followed by that, the localization vendor will do a final check of screen reports, make sure that they’re all set to be submitted, usually ranging from 2-4 days to review all those, make sure they reflect the English source file accurately, make sure they meet all the requirements of that country, and then send them to the eCOA vendor to create the final package, which is sent to the sponsor. So the total of this timeline can take 8-20 weeks, which does sound like a broad range, but it really, as I mentioned before, is determined by the number of languages used, how many instruments are being used, and then the text process. And one important thing to note about this standard timeline we laid out is that they do not include a developer review step. Given that all developers have a different preference of how involved they would like to be in the process, and where they would like to be involved, there's not necessarily a standard way of listing that between these steps. But that is one thing you do want to consider when using a COA. And now Colleen will be talking about the importance of linguistic validation. Great, thank you. So I’m going to go this point of linguistic validation. We’ve been talking about some of the other texts and the other work that gets translated, but not necessarily the COAs and the process that we recommend they undergo. Before I get into the details though, I’m going to turn it back over for a quick polling question. Great, thank you very much Colleen. At this point I do have our final polling question for the audience. Again you can click on that in real time, just vote on your screen. Here, the question we are asking is, how often do you use clinical outcome assessments in your clinical trials. Your options are always, often, sometimes, rarely, or never. And again, the question is, how often do you use COAs in your clinical trials. And we’ll just give the audience a few more seconds to vote. And here, looking at this, most of you have voted, so I’ll be closing that now, get your last few clicks in. And here we can see the majority is at 39% often. Next is 31% at always. 19% at sometimes. And 6% for rarely and 6% for never. And with that I’ll pass things back to you, Colleen. So let’s get back into when linguistic validation is required. I think over the last few years, since the FDA guidance of 2009 came out, of course more and more of our clients are well versed in the process that they need to go through. But still, you know, probably on a weekly basis we have a client who has never heard of linguistic validation before, but yet is using a COA for a primary or secondary endpoint in a study. So really, where we are coming from is that the FDA and ISPOR recommend that any COA serving as a primary or secondary endpoint or supporting a labelling claim needs to go through the linguistic validation process. With patient reported outcome measures, that really means a cognitive debriefing process where we do interviews with patients in target countries to solicit their feedback. If you’re using a clinician-reported outcome measure, then it goes through a clinician review step. 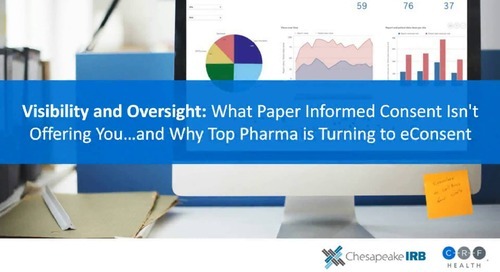 We have actually seen situations where clients have not gone through a full linguistic validation process or have chosen not to, due to budget or time constraints, where the FDA has actually rejected their data and they’ve had to go back and redo it. So it’s very important to understand this up front and, as we’ve been mentioning, plan accordingly with timelines to ensure that everything can be done for submission. So we mentioned licensing a bit. Jane mentioned it before, but just to get more into detail here. Many of the COAs that you all use in your studies have already existing validated translations available. This should really be the first step when looking at any sort of process with COAs. If there are existing validated translations available, we certainly do not want to re-translate them. We want to use the existing validated version. Now the big question is, how do you get this version. They are all held by a developer or copyright holder. And they must be licensed for use in a clinical trial. Now, some questionnaires do not require licensing, but most do. This is something that you can handle on your own or you can have a company like TransPerfect or CRF Health handle for you to actually deal with the developers, deal with the license holders, handle the contract negotiation so that you can obtain your questionnaire, both in English and also the translations that already are available. We also want to make sure that we’re including the developer in the process, as Brielle mentioned briefly before. So some developers want to review the back translations, for example. Other developers want to review the cognitive debriefing results. So it’s very important that when we’re setting up timelines that we are including them in those timelines, so then there are no issues down the road while waiting on a developer for weeks to respond regarding a question. As I mentioned, it is different for every single developer, so this is something that we need to determine at the very beginning during the licensing process to see which languages exist and where the developer needs to be included, and we can also manage that process for you. So in order to kind of understand what that step looks like, you know, linguistic validation, sometimes it means different things to different people. But really when we go to talk about paper linguistic validation, which is on the left of your screen, these are the steps that we go through. So it starts out with a concept definition. We want to look at the English version, we want to ensure that any concepts are fully understood. This is really when developer involvement is really important. For example, a questionnaire might say, "I’m feeling blue today”. That would be something that we would want a developer’s involvement on. Does blue could mean they’re feeling sad, does it mean they’re feeling moody, does it mean very sad. We want to ensure that there’s no ambiguity there before we start the translation process. And every language will go through a dual forward translation, and a reconciliation of those two forward translations. That translation will be put through a back translation process, meaning it gets translated back into English. And then a resolution of the forward and the back translation. Also we want to localize for particular dialects, which Brielle mentioned before. One example would be if the source questionnaire was developed in the United States, but is going to be used in England, we would want to make sure that we’re adapting the language, the spelling and the terminology, for English from the UK for example. This is a spot where sometimes the sponsor or developer wants to review, and we can implement that and include that in the timeline from the beginning. If you are using a clinician-reported outcome, this is also when we would have a clinician review. It’s very important, TransPerfect will only use clinicians residing in the target country that are specialists for that disease of interest. Separately, if it’s for a patient-reported outcome measure or observer reported outcome measure, we want to make sure that we’re using cognitive debriefing. And our interviews are done face to face with the patient in the country. So for example, if you're working on a diabetes study for Germany, we would do five face-to-face interviews with German patients that were diagnosed with diabetes. Five of these are the standard. Sometimes we’ll have up to ten, depending on the developer requirements. Again, sometimes the sponsor will want to review, or the developer will want to review the feedback. We want to go through all of the feedback to see what is necessary. Again, we’re not trying to do any sort of straight translation, but we’re looking for a conceptual equivalent. So what term in English is the same term in French, and is it perceived the same way. So we’re going through all the feedback to look at it from that perspective and we would implement it into the final questionnaire. We would do final proofreading and formatting, and then deliver it to you along with a very comprehensive final report that explains every step within the process. So this is with the paper process. It's important as well to see how that matches up to the eCOA process. And Brielle is going to go into a little bit more detail on how we recommend migrating eCOA. Great, so now we have that final paper linguistic validation, that the subject will be filling out using a pen and writing down their answers, how do we take something in that format and deliver it in an electronic device—a tablet, a hand-held device, something where the screens are involved. The first step here is called a migration assessment. This allows for the eCOA and linguistic validation providers to assess the initial setup of the eCOA software. This assessment can determine whether system modifications are necessary to allow for translations to properly be mapped and displayed on the screen. This additional step will also prevent study delays as well as quality issues as it allows issues to be addressed early and avoid later difficulty. So after that step is completed, we move to kind of a similar process as we outlined before, where the LSP translates electronic adaptation text, which is any text that need to be modified for an electronic device. So instead of saying circle the answer you say touch the answer. Or instead of saying turn to the next page, you would say go to the next screen. Anything that is involved in the paper format that would not make sense on an electronic device needs to be updated. And then also generic tests, so anything involved in the pop-up, anything related to a forward or back button, things like that appear on the device, the LSP will translate that in the format that the eCOA provider prefers and deliver it to the eCOA vendor to generate the screens. After the screens have been generated, the LSP will review the screenshots, and again this is where sponsor review would come in as well, if they would like to have in-country reviewers take a look at the translation. After that there are several different methods that can be used for additional testing. The LSP can perform usability testing, cognitive debriefing, and/or equivalence testing. And the type of testing that’s most appropriate for your study really is determined on a case-by-case basis, depending on how many changes were made between the paper version and the electronic version. So that’s something that TransPerfect or any other LSP can work with you to determine the best solution for your study to yield the best results. After that’s completed the eCOA vendor provides the sponsor with the final linguistically validated screen report and would also pair those with the QRG, the device labels and the certificates, as we mentioned before, to be submitted to IRB. Thanks Brielle for that, explaining the differences. 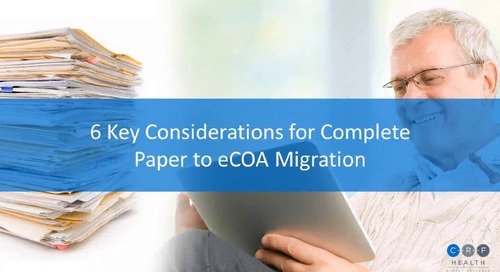 Now, just because there are a few other services that come up with the linguistic validation and eCOA migration, we wanted to mention them here. So one of course is the licensing and copyright agreements which we can handle, which we mentioned. Another is if you’re working on your own questionnaire, an English validation. So actually having the English go through anything from cognitive debriefing all the way through to psychometric testing. So we can also help with that. And it’s important that that is done prior to any translations starting, because any of those changes might be required after looking at the English. We can also help with transcription. So whether it be interview transcription or cognitive interviews for your own English that you’re developing, or any other languages. We mentioned the eCOA integration and also the equivalence testing. So you know, depending on the amount of changes being made in the English, from going from paper to electronic, when equivalence testing is required that is something we can absolutely help with. The usability testing of actual sites. And then often what we’ve found with our clients is that there’s this real difficulty organizing and managing all of these questionnaires, whether it be paper or electronic, and the licensing agreement and the certification. We can help with the organization on that with a library. And for paper versions, helping with the study binder formatting. So these are some additional services that might come up, or requirements that might come up that also can be combined with the study. So I’m going to turn it over to Jane now, who is going to talk about some best practices within screen-specific considerations. Thanks Colleen. So the things we need to consider when we’re handling translations for a device. We want to confirm if there are any reference files. So if we already have standards, if we already have templates, if we already have the validated assessments already with the appropriate layout, the appropriate wording for eCOA, let’s say, then we want to use those first. 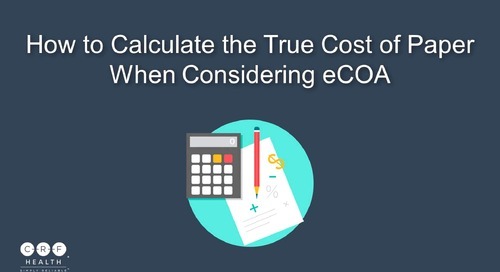 We also want to define any eCOA software limitations. For example, if we receive a request for a translation of a very complex language with a very complex font, we want to make sure that the device itself has the capability to handle that font. We need to define character limits. For example, if there is a certain resolution on the screen and it can only handle certain amount of text on the screen, what do we need to do for that question. And that’s where we may go back for additional review from the developer to see if we can—how we would lay that out on the screen to best keep it to match what the intention says. Additionally we need to consider right to left languages, in particular like Arabic or Hebrew. How do the questions flow, how does the text layout on the screen. Do the back and next buttons get changed because they're working right to left, instead of left to right. Visual items to consider, defining any screen placeholders, for example an ampersand sign, does that work in all fonts, in all languages. We also need to define any text that populates across multiple screens. So for example, if we are defining the word “back” or the word “next” or standard phrasing for months or days or years, and those are being used on multiple screens, as mentioned earlier, sometimes a word may—the back and next may not be a good example—but the word may appear singular on one screen but plural on another. And if we are using that text across multiple screens, we need to notify the LSP so they’re aware to provide the appropriate translated version for the question or for the text in a specific language. That’s all important when handling the translation, so the more information the eCOA provider or the eCOA vendor can provide to the translation agency, the more accurate the translation can be and the need for fewer rounds of review. Additionally, time and date format. When will the time and date format appear as month-day-year, day-month-year, year-month-day or any of that. All of those need to be defined up front. Thanks Jane. I’m just going to walk through a few TransPerfect best practices, which can also be applied to a number of other language service providers when it comes to eCOA. So the first one is that we always require eCOA vendors to provide an English screen report that a linguist can use for a reference. So again, the screen report is the report with all the subject-facing screens and pop-ups. And our linguists will reference this when reviewing the translated screen report to make sure that everything matches up, the screens are in the correct order, that it looks identical. Secondly we also would like to insight on context and usage of all formatting types of placeholders prior to translations. So we’ve touched on this a little bit before. But what words are being populated into multiple screens, how do we ensure that they’re showing up singular or plural, masculine or feminine, just making sure to adjust all that on the front end, so that we don’t find issues in the screens later on. Additionally, we would like to communicate with the eCOA vendor to determine if the application text is already available in the required languages that the sponsor will be using. So application text includes abbreviations for months, warnings about low battery levels or update installation. And since these screens are pretty commonly used across devices, it’s possible that we can translate it once and then use them across all devices in a study to maintain consistency and then drive down timeline costs for translation process. Kind of related to that is using translated generic text across studies to maintain consistency. So again, wanting to reduce the amount of translation work that’s required, to make the entire process go faster. The final thing that we want to look at is if devices are available for use during cognitive debriefing. Typically we always receive the screen report that patients will provide feedback on during a cognitive interviewing. But if it is possible to do that process using the actual device, it’s certainly recommended as it can reveal other responses about usability of the device, how things are showing up on screen and other patient comprehension feedback that’s really valuable to final translation. And also related to that, we would want to know if the eCOA vendor has devices available for post-localization testing. This would determine however many devices they can provide, help to map out the timelines and which languages can be used on each device. Thank you. So one other study groups considerations. We’ve been talking about everything to do with eCOA and patient-facing in the middle of the trial, but what do we do to support them. So the additional items that you need to consider are multi-lingual help desk. If sites are calling in, they need to be able to handle receiving an English speaking operator, but what happens if the subject needs support. So that multi-level help desk is very critical to provide instantaneous support as well as to ensure the satisfaction level. If you want to keep a subject retained and keep them in the study and keep them happy about being in the study, one of those things is to provide them the support using their language, so that they can get immediate response and be able to move on with the assessment or with their day or whatever they need. That is something that both eCOA vendors like CRF Health can provide, as well as translation providers also provide, like TransPerfect, has that level of service too. Another thing to consider are how are multi-level training materials for site personnel managed. Now this could be anything from at an investigator meeting providing simultaneous translation. It could also be localizing some of that training material, whether in a PowerPoint slide or some type of e-learning. All of that could be handled via translation and localization, so that if you have turnover or study coordinators that maybe don’t speak English, they have that training in their own language, and it helps for better understanding and smoother process. One of the things we need to consider when we’re building the diary is, can the site personnel handle all of the site functionality in English. And most of the time we provide it in English. But there are some times when we need to consider translating them. For example, if we’re in Japan, we often have the request to translate the site manual, which is all of the instructions for the site on how to use the devices, and to monitor the data. But additionally, we might get the request to actually translate the screens for how to set up a subject or how to send data or how to deactivate a subject, all of those administrative functions that site personnel need to do on the device. And finally, customs. 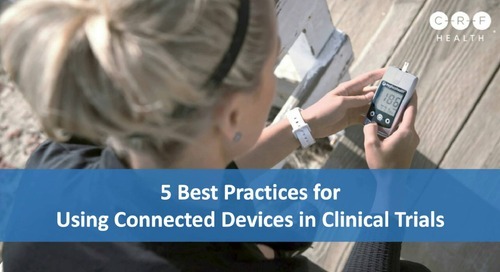 How is device shipping to other countries coordinated, either for cognitive interviewing or for patient use. All of these things may require some type of translation. For example, if you need a specific certificate to get a certain device into a certain country, you might need to consider that up front. So all of these things need to be handled very early in the study and not wait until the week before you need to have the device on site. So those are just things to consider up front. And obviously, you want to provide seamless consistent translation of those items so that there’s no confusion across documents or across training or anything like that. And now I will hand it back over to Michelle. Great, thank you so much, Jane, Brielle, and Colleen, for that insightful presentation. Now I would like to invite our audience to continue sending in your questions right now using the question window for the Q&A portion of this webinar.